Are you into Brazilian beauties? Is this the reason why you’re at this BrazilCupid review? Then you have come to the right place. As you all know, Brazilian women are known to be the most beautiful around the globe. They often have perfect hair and perfectly shaped bodies. These are the reasons why a lot of men all over the world are attracted to them. Fortunately, the internet made it easier for everyone to meet women across the globe, including Brazilians. 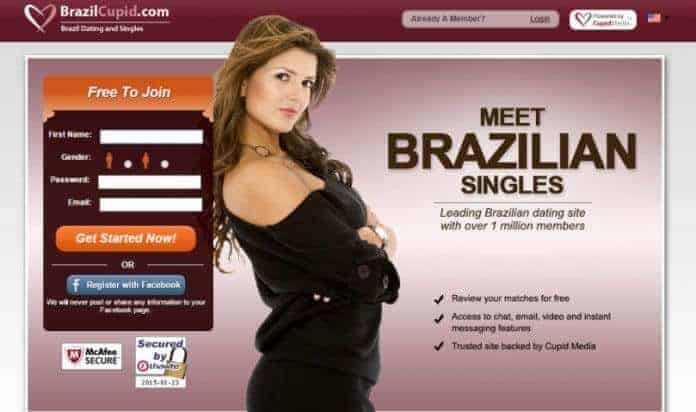 And this is by creating online dating sites, including Brazilian dating sites. But before hitting that sign up button, reading this BrazilCupid review would definitely be ideal. BrazilCupid was established in the year 2004 and is one of the largest and oldest online dating sites for Brazilian. BrazilCupid is part of the Cupid Network, which is known to have more than a million members on their website. The reason why BrazilCupid is the tip site in Brazil is that they focus on finding a date instead of being a marriage or mail order bride agency. You don’t have to worry about anything because BrazilCupid does not send letters or have someone arrange a date with a woman. For you to be able to find a date successfully, you need to create your own profile. In this way, you can browse for members and send messages to find a potential date. The first thing that you need to do for you to be able to start meeting Brazilian women is to make a free account on BrazilCupid. The signing up process will only take a minute. You have the option to sign up using your email address, first name, password, email, gender, country/city, and as well as your age. If you don’t want to fill those up, then it would be best to sign up using your existing account on Facebook. Once done, you need to make sure to check the box, where you agree with the terms and condition of the site. After that, you will start checking out all the single Brazilian women on BrazilCupid. After signing up, you will be redirected to a page where you can check for potential matches in Brazil. But in order for you to be able to increase the rate of response from other members, you need to make sure that your profile is equipped with the required details. Always make sure that your profile is presentable to attract women. Across the site of BrazilCupid, your profile photo will be displayed. So it would be best to choose a current picture of yourself. If a member starts searching for you, your photo will be the one to show up on the search results. You need to choose a photo that shows that you are a fun and confident man. It would also best to upload extra photos as your photos will usually account for at least 80% of your dating success. As you all know, a photo is always worth a thousand words. Now, when it comes to completing your profile, you need to fill out some questions. These questions will usually be about your appearance, lifestyle, cultural values, and background. You will also need to write something about yourself. When it comes to completing your profile, you may want to answer as many questions as possible. This will help you show up no matter what kind of filters a member use to find a match. Another good thing about answering a lot of questions is that your profile will look appealing to a member who may be your potential match. Just make sure to answer the questions truthfully to avoid giving the wrong impression. Once you have logged in to BrazilCupid, the matches will be displayed based on your match preferences. It would be best to start editing this section when needed, for you to only be able to see women who passed your filters. Also, you need to set the language based on the language that you are comfortable in. If it is English, then set the filter to that language. This will make things easier for you as you will only be shown women who know how to speak English. But of course, if you think that you can learn Portuguese then, by all means, learn it. You will surely be able to impress a Brazilian woman with your Portuguese language. Yet, according to a survey, Brazilian women who are speaking in English usually have good jobs and are more educated. This is where you need to add to your hobbies and interests, so you can match with a woman who has the same interest as you. It would be best to fill this out and to be honest about your hobbies and interests no matter how familiar you think they are. Plus, both of you will have something to break the ice with, since you will have common interests. Just like with the other online dating sites, there are also personality questions that you would want to answer. You have the option to answer or just skip this part, but answering the questions would be ideal. The reason behind this is because the members will get to know more about your passions and your favorite activities. Who knows, some of them have the same activities as you! Cupid tags is another feature of BrazilCupid that you need to know and use. You can use tags as these tags will be used by members to find other members with the same interests as them. The best space where you can add tags is when you are describing yourself. But don’t overdo it, as your profile might look annoying. Now, once you have found the member that you want to contact, the first thing that you need to do is to check if the person speaks English. But if not, don’t worry as you can use Google translate to help you in translating the messages from English to Portuguese. Once done, you can just copy and paste it on the message box and hit send. Now, if one of you is a premium member, then she will be able to receive the message. But if both of you have a free membership, then she won’t be able to read your message. There are two kinds of membership on BrazilCupid, which are the Platinum and the Gold one. They all have different packages and features that you should know. Below are their prices and descriptions. As a platinum member, you will be able to enjoy all of the features of BrazilCupid. Your profile will also be highlighted In the search result, which will help you get more attention. Your messages will also be translated free of charge, so you no longer have to worry about Google translate. This just means that getting a premium membership will give you options and freedom since every member will be able to read and reply to any of your messages. The platinum member will help you save money especially if you are planning to use the site to find someone that you would want to spend the rest of your life with. As a gold member, you will be able to send and receive an unlimited message to any of the members. You will also be able to use the live chat, and you no longer have to worry about viewing any ads. These are the available memberships on BrazilCupid besides the free one. Now that you have learned everything that there is to know through this BrazilCupid review, it will soon be up to you if this is the dating site for you. If you are into Brazilian women and you don’t mind the language barrier, then there won’t be any problem at all. Just make sure to enjoy the experience and be cautious with whom you are talking to.